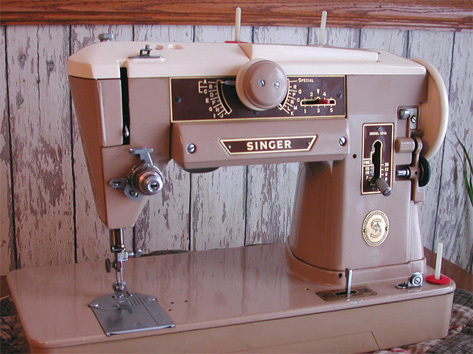 This tan Singer 401A is our latest slant needle machine. We purchased it at an antique mall in Waynesville, North Carolina on March 1, 2008 on our way home after attending classes at John C. Campbell Folk School in that state. We feel fortunate to now have a tan 301, a tan 401, and a tan 500. The above image shows a sleek design of the rear of the 401. Note that there is no external motor. This machine has an internal motor and is gear driven. Metal gears (not plastic) should permit this machine to be around for a very long. Other than the electrical cord, there appears to very little that can go wrong as a result of age-related failures. When we got the machine, the motor would only hum but would not drive the machine. It took a bit of oiling and cleaning and turning by hand to get everything freed-up. It now runs perfectly. The image at right shows the slant of the needle bar. Additionally, the hole in the base is where the portable cabinet attaches. This is a nice design but we always double-check that the latch is secure before walking off with the machine. We will sometimes even carry the machine by putting our hands under the machine rather than relying solely on the carrying handle and the latches. The image above shows why we like these machines. Note the feed dogs. Unlike many machines, there are "teeth" the full length of the pressure foot and there are also teeth behind the needle. In effect, there are twice the number of teeth here as can be found on some other machines. When a piece of fabric is started in the desired direction, the machine will pull it through very straight and the less you fuss with it, the straighter seam it will sew. Another feature which we like is that the presser foot is 1/2-inch wide. Since we sew mostly quilt patches with a 1/4-inch seam allowance, the patches can be placed on either side of the needle and aligned with which ever side of he foot is appropriate. There are two plates available. 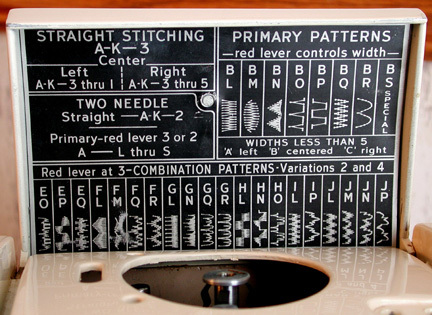 One is for straight-stitch sewing only and has a single small hole and referred to as AK3 because that is the setting of the dials if you don't want to break a needle. 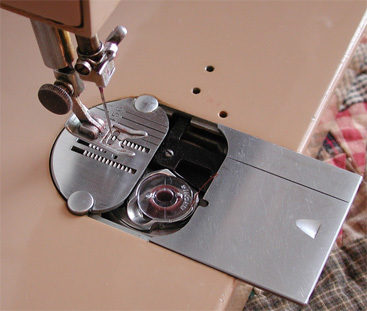 This AK3 plate provides better fabric support for straight-stitch sewing. The second plate has an elongated hole and used for other than straight-stitch sewing. 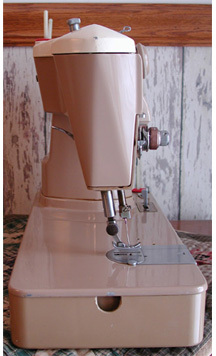 A control on the machine base raises the plate (which has the effect of lowering the feed dogs) for free-form sewing. The stitch-length control is seen at right. Fine area is used for creating various stitch patterns. Serial number of this machine is NB715925. 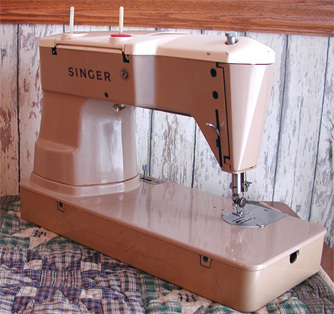 According to Singer's website, it was made in 1956 in Anderson, South Carolina. 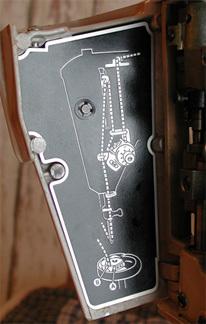 Threading diagram is printed on the front access plate. We have seen a recommendation to route the thread prior to entering the tensioning disc behind the guide. We have tried both routes and see no difference. The two round knobs are used to select cams built into the 401A. The outer knob selects positions A - J while the inner knob picks positions K - R. By moving the pointer to different positions, various patterns can be selected. 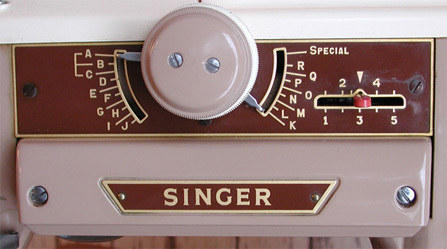 The red lever positions the needle left to right and is used in conjunction with the other knobs to vary stitch patterns. 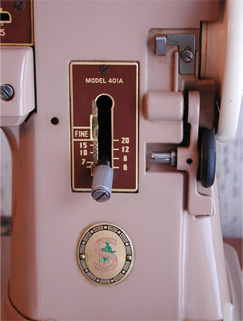 The cover on the machine contains a partial list of patterns that can be obtained with the 401A's built-in cams. Positioning of the red lever will cause the patterns to vary considerably from this diagram. Also shown in the above image is the access hole where other cams can be used to produce additional stitch patterns. The work below was created using the built-in features of the 401A. Patterns selected were BM and FR. Stitch length and width controls were "fiddled-with" to get the desired pattern. We still have a tension problem as the pattern is slightly less than symmetrical.